It's not difficult to look younger than you really are if you take proper care of your skin. Following a simple anti-aging skin care regimen can keep your complexion looking fresh and youthful for years to come. The sooner you start, the faster you will begin to see results. Taking care of yourself can help keep your skin healthy - even as you age. Stay Hydrated: Keeping your body well hydrated is a basic tenet of anti-aging skin care. Studies indicate that Americans are dehydrated over 75 percent of the time. Since your body is made up of over 75 percent water, a lack of this substance can have a negative effect on skin cell function. When your cells function at optimal level, your body sheds dead skin more quickly. This gives your skin a healthy glow. Lack of water coupled with rising caffeine consumption produces a diuretic effect that can result in serious health problems and negative cosmetic results. Healthy Diet: Eating right is another way to keep the wrinkles at bay. Eating a wholesome diet with plenty of fruits, vegetables, and whole grains is a sure recipe for beautiful skin. Think of your body as a finely-tuned machine for which you want to provide the best fuel. Your skin, in particular, needs certain vitamins and minerals to look its best. For example, vitamin A reduces sebum production to prevent blemishes, vitamin B contributes to even skin tone, and vitamin E reduces acne scarring. A certain amount of sun exposure is necessary to create vitamin D, which regulates calcium and phosphorous levels in the blood. However, excessive exposure can lead to long term damage, premature aging, age spots, and even skin cancer. 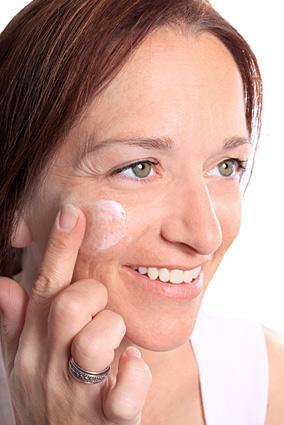 Wearing sunscreen is a very important part of anti-aging skin regimen. Be sure to use a sunscreen that provides protection against both UVA and UVB rays and has an SPF of 15 or higher. If you are active, take care to reapply the lotion every few hours. Remember that sunscreen is not just for the beach, but also for everyday use. Direct exposure to midday sunlight, especially for fair skin, can lead to cumulative skin damage. These days, it's simply not possible to walk into a drugstore without seeing a shelf full of anti-aging products. It makes sense, since aging is one of the greatest skincare concerns in the world. Halting the effects of time, reversing those aggravating lines and preventing future wrinkles are all paramount in the fight against aging. Vitamin C: Used as a topical aid, it helps rebuild the skin's collagen, resulting in a fuller, plumper complexion. By increasing cell turnover, it allows the skin's natural radiance to shine through. Retinol: Millions of people rely on this wonder ingredient (vitamin A in its purest form) for its ability to penetrate through the skin's layers, stimulate collagen and elastin, exfoliate and feed antioxidants to the skin. Antioxidants: They're an absolute must in the fight against free radical damage (such as cigarette smoke and pollution). The skin is brighter, more refined and smoother with regular use. Alpha Hydroxy Acid (AHA): It encourages a smooth, youthful appearance and supple skin by exfoliating dead skin cells that collect on the surface. It also combats fine lines. Beta Hydroxy Acid (BHA): This hydroxy is a gentler form of acid than alpha. Also known as "salicylic acid," this same ingredient is found in aspirin. Beta hydroxy is safe enough to use daily, but the effects are slower to appear. Look for it on product labels as BHA or salicylic acid. CoEnzyme Q10: The skin's ability to elasticize and firm is encouraged with use of Q10. It works to replace the skin's natural Q10, which diminishes with age and is responsible for keeping the skin toned and smooth. Vitamin E: It provides natural protection against UVA and UVB radiation. Vitamin K: This is a multipurpose vitamin that has a strong effect on aging skin. It helps fade age spots, spider veins, blotchy skin and other discolorations. Green Tea Extract: When used in addition to sunscreen, green tea is known to increase sun protection. It's a powerful antioxidant with strong anti-inflammatory properties, and helps stop free radicals in their tracks. Grape Seed Extract: One of the most powerful antioxidants available, it promotes healthy blood circulation, protects cells from free radical damage and slows the aging process. Both AHA and BHA will make the skin much more sensitive to the sun's rays. If you are using products containing these ingredients, or recently had a chemical peel, your skin will be much more susceptible to burning than usual. To be safe, stay out of the sun as much as possible or wear protective clothing. Here are a few of the popular products on the market. L'Oréal Paris Advanced RevitaLift Deep-Set Wrinkle Repair Night Crème: This is a popular night cream that contains pro-retinol and can improve the appearance of deep lines and wrinkles. It also can help firm up the skin with the ingredient New-Fiber Restoring Complex. Olay Pro-X Eye Restoration Complex: This treatment hydrates the area around the eyes. It also lowers the amount of fluids under the eyes to decrease dark circles and swelling. Mary Kay TimeWise Replenishing Serum+C: This product helps build up the collagen and elastin that you have in your skin already and prevents collagen from breaking down. It contains botanical sources of vitamin C like pomegranate and Acerola cherry extract. Avon ANEW REVERSALIST Day Renewal Cream SPF 25: This day cream helps reverse wrinkles using Activinol Technology. Activinol contains a protein called activin that helps promote healing of the skin. This product also protects again ultraviolet rays with SPF 25. This is just a sample of anti-aging products that you can purchase from either stores or online. Many other brands like Lancome, BeautiControl, Estee Lauder, Neutrogena, and Perricone also offer different creams, lotions, and cleansers specifically for aging skin. Having beautiful skin need not be expensive or time consuming. There are products available at all price ranges that can help improve the appearance of your skin. With a minimal investment of effort, caring for your skin to prevent the signs of aging can be simple and easy. A few preventative measures now can yield some amazing benefits later on.